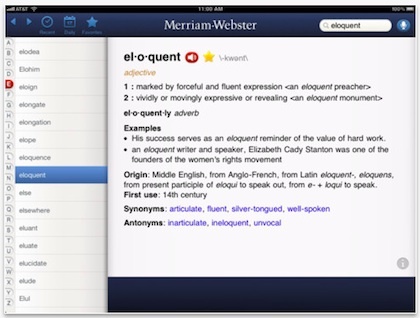 If you need a offline ‘big’ dictionary on your iPad, now is the time to jump in. Merriam-Webster HD Dictionary is on sale for $3.99, down from their normal $6.99. While the definitions in the dictionary is the same as in the HD ‘pro’ version, you will no longer have ads showing up and you get voice search. Voice search is pretty important if you have no clue how to spell the word. Usually, with a typed in dictionary search, after you get a letter mid word wrong you get nothing. Other ‘features’ of Merriam-Webster HD include Integrated Thesaurus: Synonyms & Antonyms, Example Sentences, Audio Pronunciations, Word of the Day and Biographic and Geographic entries. You do need Internet access for viewing illustrations.